Tonight, I was scheduled to cover a town board meeting in Windsor, New York, where officials were going to review a plan to change their zoning to allow fracking. The process for a zoning change promised to be long and contentious, and was necessary in light of a recent court ruling putting the decision of whether and where to drill in the hands of local governments. Things changed dramatically this afternoon, when Governor Andrew Cuomo announced that he would ban shale gas development statewide due to unacceptable health risks. Cuomo’s position, backed by a long-awaited report from the state Department of Health, is a departure from his earlier position that he would allow fracking where local governments favored it. Reporters, pundits and the public they serve are still getting their minds around Cuomo’s emphatic decision, which came after more than six years of policy review. While it puts the matter to rest, many questions remain: What are the legal consequences? Do industry lawyers and supporters, who have been beaten at every turn in their efforts to bring shale gas to New York, have another challenge in them? Or is this the end of the line? So why did it take six and a half years? Science takes time. Establishing risks of high volume hydraulic fracturing and the new era of on shore drilling it has enabled is especially difficult because shale gas development is relatively new. The industry controls most of the information and has plenty of legal, scientific and political wherewithal to challenge any conclusions that don’t work in its favor. Science is part of the calculus. But despite what Cuomo would like us to believe, scientists don’t make these kinds of decisions. The full equation is Science + politics = policy. Cuomo finally got tired of being hounded on the issue by his political base. The movement in New York against shale gas was relentless and it was focused on him. At one point, he told Susan Arbetter, host of Capitol Press Room, that it was the most effective political action campaign he had seen. (I will link to that interview as soon as I find it, but I wanted to get this post up right away.) Activists, both institutional and grass roots, promised to step up their efforts if Cuomo allowed even a single well. The Home Rule decision by the state’s high court in June, and the depressed price of natural gas made a decision politically easier. Cuomo would have a hard time taking the perceived riches of fracking from landowners back when landmen were at their doors with big checks in hand. Nobody is currently seriously looking at shale gas exploration, much less development, in New York with gas prices as low as they are and the encumbrances of Home Rule. New York has become a showcase for the anti-fracking movement, and Cuomo's decision today has raised the movement's stature nationally. But it’s also important to remember that Cuomo’s decision is the end-point of a process that started 6-plus years ago - before frack was a bad word. 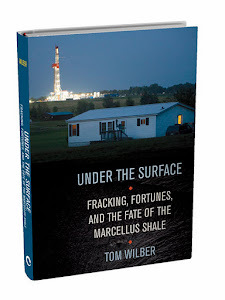 As recounted in my book, Under the Surface, the moratorium issued by Governor Patterson in July, 2008 had nothing to do with organized fractivists, who did not appear on the scene until after Josh Fox’s movie Gasland two years later. New York’s moratorium was the direct results of landowners posing reasonable questions in public hearings about how the state was prepared to govern shale gas development. Six and half years later, Cuomo’s actions have provided the answer: it wasn't then, and it isn't now. "Cuomo finally got tired of being hounded on the issue by his political base. The movement in New York against shale gas was relentless and it was focused on him." Tom--I would agree that the "movement" was relentless, that it is tiresome but not always that it was targeting him. The movement is actually targeting FERC, everyone who possibly is connected with approving any infrastructure. Port Ambrose has always on paper, via the US Coast Guard actually been described as a delivery project. And many of the antifracking activists who created the rumor that this project was intended for export were presented facts and information that said otherwise. If this cause is going to be raised even higher in the national spotlight someone ought to be looking at exactly what tactics this super organized group of folks actually uses. One tactic they use is misinformation. Another is making everything including an LNG delivery project about their cause. http://www.longislandpress.com/2013/07/31/long-islands-offshore-lng-port-proposals-critics/ I'm sure you will recognize the gentleman in the photo. It's not entirely accurate that organized fractivists hadn't appeared on the scene before Paterson declared a fracking moratorium in July 2008. In the spring of that year Catskill Citizens for Safe Energy, Mark Ruffalo Sierra's Roger Downs, Catskill Mountainkeeper and others lobbied against a well-spacing bill that was intended to facilitate high-volume fracking. The bill was rushed through the legislature late at night on the last day of the session but when Paterson signed the bill into law, but he also recognized that HVHF was unlike conventional gas extraction, and he ordered the DEC to complete an SGEIS before issuing drilling permits. To my mind, Paterson is one of the unsung heroes of the anti-fracking movement. Buce, Thanks for sharing those details. That's where it all started, and the organizations you name were critical in understanding the impact of all this before others, but Patterson's decision was also guided by tremendous grass roots involvement at town hall level. Tom, Do me a favor and ask Mr. Ferguson why it is that he personally http://www.longislandpress.com/2013/07/31/long-islands-offshore-lng-port-proposals-critics/ in a variety of places implied that a proposed LNG delivery project offshore of Long Island is actually secretly obviously an export project. http://www.regulations.gov/#!documentDetail;D=USCG-2013-0363-1083 A draft EIS has been released on the project and a multitude of antifracking groups were made aware that an expansion currently underway and which was under review at the same time that this port was being reviewed would indicate that Port Ambrose is as the paperwork has always stated a delivery project. http://www.newsday.com/opinion/andrew-cuomo-makes-the-right-call-on-fracking-lane-filler-1.9724052 I think the caption under the photo really says it all. Eric Weltman is rallying against a "fracking facility" off of long island. The LNG delivery project has a name. It is Port Ambrose. One has to wonder why it is that so many reporters including yourself questionned whether this port was for import or export when the rockaway lateral project currently being built is primarily about redistribution of supplies that are now only capable of being delivered to Long Beach Long Island. Course I have read in the news that the rockaway project delivers 650,000dths of fracked gas mostly this past summer while it was under construction. Those articles failed to say that 550,000dths is already capable of being delivered. This has been ongoing in multiple places and not just by this gentleman for the last year and a half. Not to mention what the antifracking movement actually did when it comes to the rockaway pipeline project as well. The rockaway lateral project has a history that overlaps with not just the currently proposed port ambrose but with the prior LNG project proposed for offshore, as well as the earlier version of Liberty's project which an amended application was ready to site in the exact same spot by early 2012. BOTH companies filed paperwork under the rockaway docket as well. Information on Port Ambrose and the rockaway project was made available to many of Mr. Ferguson's friends who for some reason chose to bury all of this information in favor of a conspiratorial export theory on port ambrose. Those are some facts as opposed to the theory that Port Ambrose is a bait and switch for export. On the surface, Cuomo did not ban HVHF. Rather he allowed Martens and Zucker to decide and Martens to eventually ban. Under the surface, the decision was Cuomo's, and it may be years before we know why. JLCNY may wait until they have something more substantial to attack, such as the DEC's final SGEIS or Martens' finding and prohibition of fracking. And this puts the matter to rest only in the sense of napping, not rest in peace. The next governor could restudy the subject and lift the ban. Good points. Policy can be politically and legally undone -- especially energy and environmental policy. Yet ban + home rule = huge barrier to economic incentives to develop NY shale gas in foreseeable future. Who knows where our state and national energy plan will be in four or five years? Legal challenge will not materialize anytime soon, if at all. They are a long-shot and would take years. On today's Capitol Pressroom, the perspective from Tom & Tom. Industry lawyer Tom West said that there probably won't be a judicial response because industry has no interest in funding one, and Republican Senator Tom Libous said that there probably would be no legislative response either. In the same program, Martens allowed that his finding that will prohibit fracking could be revisited in the future years. "As recounted in my book, Under the Surface, the moratorium issued by Governor Patterson in July, 2008 had nothing to do with organized fractivists, who did not appear on the scene until after Josh Fox’s movie Gasland two years later." I guess that, depending on how you define the term "organized fractivists," your sentence could be technically true. But I think it's important to note that many of us were very, very concerned about fracking while Gasland was still just a glimmer in Josh Fox's talented eye. The impetus for many of us was the appearance of landmen in our towns--something that was indeed already happening in 2008. In fact, I remember going to a DEC hearing, seeing Josh Fox filming there, and thinking to myself: "I hope that young man knows what he's doing, because someone has to document what is going on in NY." At that time, I had no idea what Gasland was going to be like or the effect it was going to have, but I did know that I was very worried about the effect that fracking might have. I was certainly not alone--there were many others in 2008 who had similar concerns. Believe me, a LOT of us did phone Gov. Paterson, and our state legislators, asking them to please not rush to frack! The anti-fracking movement was already underway prior to Gasland. This is not to discount the importance of Gasland--Josh Fox's work informed and inspired many, many people and it's very possible that we could not have gotten a ban without his work. However, as important as Gasland was, I think the internet was even more important, because it allowed fractivists to quickly gather and share information not only with each other, but with the rest of the country and the rest of the world. Anyway, my main point is, many of us were paying attention and taking action prior to Gasland. Thanks for pointing this out, Mary. As Bruce points out (above), several groups were involved in trying to put the breaks on the spacing bill and their influence is relevant in Paterson's order for a review that created the "de facto" moratorium. This effort took place at multiple levels and involved thousands of people, the vast majority of whom did their work on a 100% volunteer basis. People went without sleep, put large portions of their personal lives on hold, and just generally cut their normal, daily activities back to the barest bones in order to find time to work on this issue. And they did it day after day, week after week, month after month, year after year. As others have pointed out, if the volunteers (including, in many cases, credentialed volunteers with highly relevant expertise) had been paid for all of the hours they put in, the bill would have been a lot higher than the amount of money the gas industry poured into its efforts to promote fracking in NY. It's a demonstration of what can be accomplished when people work together not for pay, but because they believe in what they are doing. It's my hope we can muster the same sort of commitment on other issues--especially global warming.